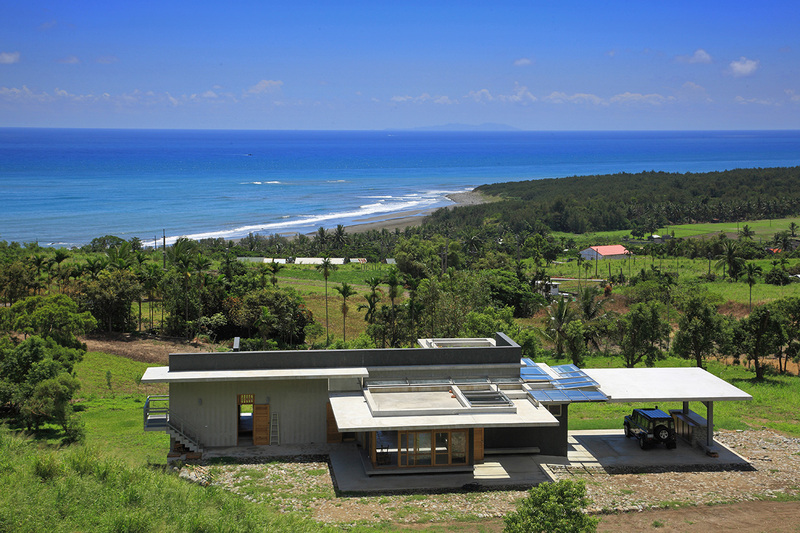 Two sisters commissioned two independent residential houses. The Wind House L is for the older sister to live in and the Wind House S is for the younger sister and their parents. The green interfacial space surrounded by the two houses is the critical semi-outdoor space connecting inside and outside. In addition to connecting to another house, the frequent usage of the interfacial space also increases the communication between these two houses. If the soul of Taitung is the Pacific Ocean and the should of Yilan its water, the soul of Hsinchu, then, is the winds of September. The winds of September are the north-eastern monsoon that started in fall every year. It crosses the Central Mountain and enters Hsinchu, brining fierce wind and the production of persimmon cake, rice noodle and flat noodles. Hence the name of Hsinchu as the Wind City. 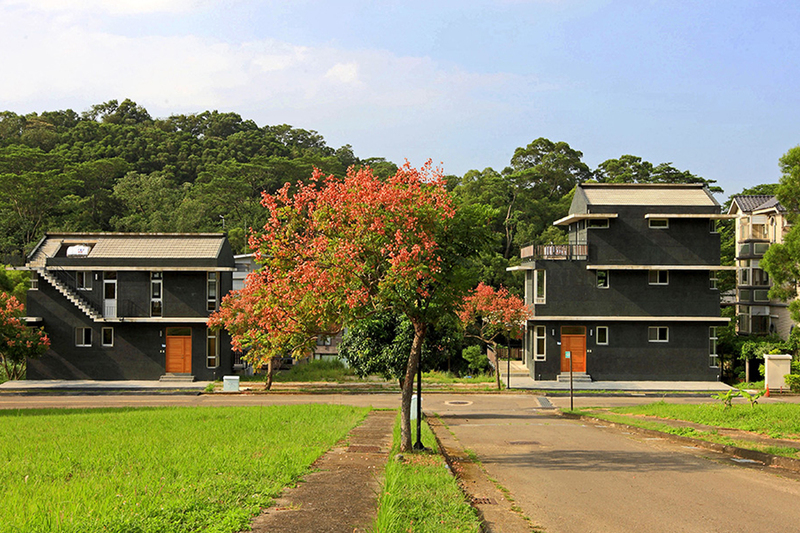 When we observe the local houses of Hsinchu, the opening on the facade are small. The inside spaces are stifling and humid. Wind direction is the invisible site condition. In Hsinchu, in particular, winds impact the design more than other visible contextual conditions. Along the southern slope of the Bao Mountain, each wall yields different architectural expression as the season changes. Every space has its suitable place in the layout for changes in winds, rain, and sunlight. Laundry room of large area and openings facing south, placed in between glass chambers. It contributing one more transitional space inside and a protection of double-layered protection of the space. In the summer it accommodates the wind, rain and sun from the south; in the winter the first window is closed most of the time when the second one open for the air flow and temperature control. Although the openings of the northern space are small, the quality of the room is achieved by receiving sunlight and air flow from the east and west sides. The corner windows of the east-west orientation varied in sizes due to the differences between southern and northern winds. They serve to extend the sight lines and regulating the temperature of the northern interior space under the fierce north wind. Each wall has its own character and expression in response to the wind. While the expressions of winds form the varied openings, those of light shape the division of walls and the movements of sunlight. The enlarged cantilevere plate and anti-beam structure enrich the interior expressions of sunlight, each flows in its own place because of the suitable protection of the enlarged sun screens. The daytime and nighttime present distinct expression of light. Austere and raw materiality and the craftsmanship amplify the character of material. The original surface of material are presented: Serpent-patterned marble of dark green, wielded L-bar window, exposed concrete ceiling, shale rock, granite floor of chiseled surface and borneo ironwood and plywood. Material gains character as time passes. When the nature of materiality made visible and the legacy of craftsmanship continue, the senses of time and space are also retained. Building has openings in response to climate and weather. Sunlight yields interior expressions for changes in day and night and seasons. People are performers in space. Too much furniture and decoration would appear artifice. Here surfaces of tables and floors define different scales, their varied heights can also serve as a bed, chair, or storage rooms. The staircase can also be seatings. When the walls, floors, and ceilings become part of furniture, the flow of interior space will be more fluent and the movement in the space easier. If we see truth to decoration and truth to self as the same affair, we perceive the world with our true senses.